My absolute favorite meal of the year – Thanksgiving. 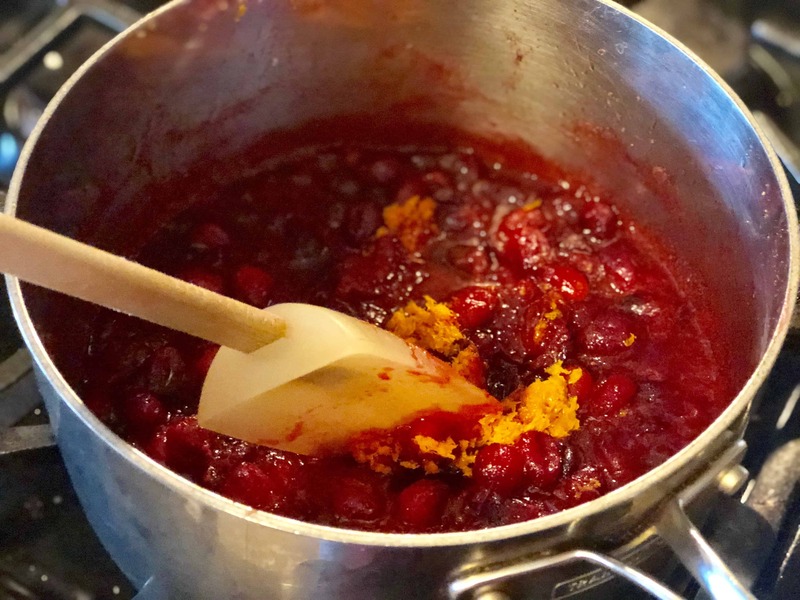 I’m going to do you a favor – I’m going to share the recipe for Thanksgiving’s Best Cranberry Sauce with you. 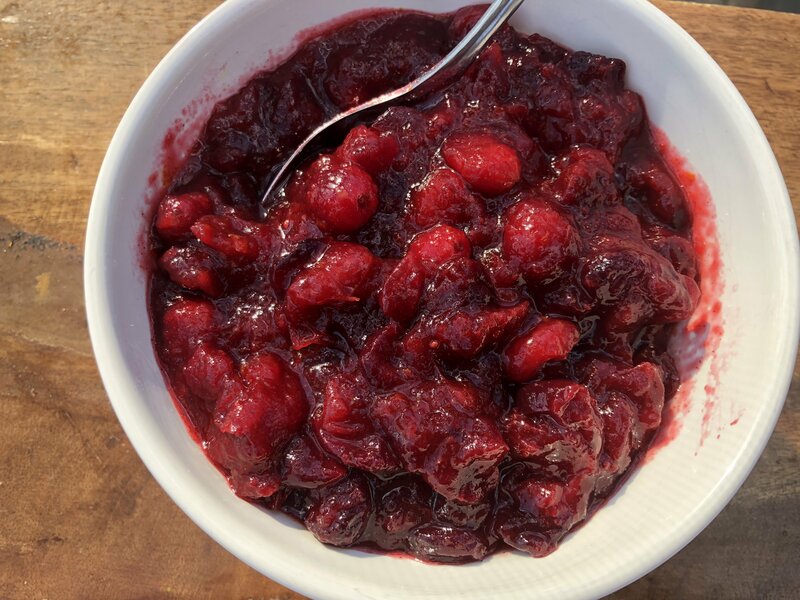 Unless your family doesn’t enjoy cranberry sauce, they will love this recipe and ask you how you did it. You’ll be in charge of cranberry sauce for years to come. Not. Kidding. Cranberry Sauce is super easy! I love it when you start to hear the cranberries popping in the pot. Once you dissolve your sugar in your orange juice – you add the cranberries and slowly cook it! You can hear them popping in the video below! There really are only two rules to making sure your cranberry sauce is good. Rule 2: Cook the sauce slowly so not to burn it. This is truly Thanksgiving's BEST Cranberry Sauce. You'll be asked to make it every year. Step 1 In a pan set to medium high combine water, orange juice, and sugar. Step 2 Bring ingredients to a slow simmer. This will combine your ingredients. Step 3 Once the sugar is dissolved, add your cranberries, orange zest, nutmeg, and salt. Step 4 Lower your temperature to low. Step 5 The cranberries will start to pop. Step 6 Cook for 15-20 minutes stirring occasionally. Step 7 Let cool and store until ready to serve. Step 8 Cranberry sauce is best served at room temperature. This side dish tastes best the day after it’s made, so go ahead and prep early. You can actually make cranberry sauce several days early if you’d like. After it has cooled, just place the sauce in a pretty dish, cover it up and you’re all set for Thanksgiving. Also take a look at these make-ahead holiday side dishes that I’ve included in a blogger roundup – you’ll love so many of them! They’re going to love it. I love it so much that I not only make two for Thanksgiving dinner, I also make a third. For day after Thanksgiving turkey sandwiches. What would a leftover sandwich be without cranberry sauce? Do yourself a favor and add this recipe to your recipe box. You won’t be sorry. After serving it this Thanksgiving, you’ll be asked to make it again! If you are searching for other fun holiday ideas to share with your family take a look at the Thankful Tree we make each year. It’s such an amazing tradition to start with your children. Enjoy your holidays!